HEAD down and umbrella high against the heavy rain, I made my way across the soaked grass and muddy paths of Regent’s Park on Sunday morning, teasing myself with the question: How many people would brave the weather for the demonstration? Thirty? Forty? Surely, 45 at the most? Had I been too ­pessimistic? 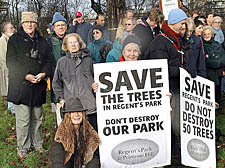 It soon became clear that I had, for as I approached the “umbrella” crowd I saw that there were nearly 200 protesters from the streets bordering the park in Primrose Hill and St John’s Wood. I should have known that those who use the park – for strolls or for walking their dogs – would be the first to want to protect it. The good solid citizens were there, many with dogs and sensible wellies, showing a quiet determination that often spells trouble for ­meddling outsiders. A poster caught my eye: “Bats not balls, fowls not fouls” it remonstrated. The Westminster planners ought to know that it will be at their peril to do away with such a cluster of ancient trees. Have they forgotten the successful agitation in the 1990s of Primrose Hill residents against the arrival of Starbucks, or the mauling ­given by the courts to Camden ­Council over a faulty consultation scheme? Under the downpour a thickening crowd squeezed up to hear a few words from the one-time presenter on Radio 4’s Today ­programme, Sue MacGregor, as she made a short speech. Then that tormentor of the plan, writer Simon Jenkins, whose childhood was spent in the park, arrived on the scene. Minutes later the crowd moved, en masse, following him a short distance away for an interview with a BBC television reporter. Then back again rolled the demonstrators to the threatened trees where their chant “Save the Park!” fought against the drizzle. Suddenly, the rain stopped, patches of blue could be seen in the sky, and everyone gathered for a group photograph. It was all very English and good tempered – most people were chatting and laughing. Malcolm Kafetz, a retired businessman who lives near Baker Street and helped to organise the demo, looked particularly cheerful and optimistic. “You know the ­officers at Westminster Council have rejected the plan – their report came out on Friday,” he smiled. Tonight (Thursday) the council’s planning committee was due to discuss the plan. Will a good solid middle-class rebellion win yet another victory? ANDREW Motion speaks with the same engaging mellifluous tones as he writes, so I was surprised by one of his anecdotes on Friday evening. Confessing that he has been under an analyst since his early 20s, he told an audience at the Holloway Resource Centre, that one of his first psychiatrists – a very distinguished national figure – fell asleep while he was unbaring his soul. “And to make it worse,” laughed Motion, “he drew up his duvet as he did so.” But, he assured everyone, he is now seeing a first-class man. Motion, our Poet Laureate, who lives in Camden Town, spent an hour in conversation with psychiatrist Denis Flynn and talked about the similarities between an analyst and poet as they pick and thread their way in thoughts and language. But, as usual, the revealing part of the evening came with Motion’s anecdotes. He recalled how after his acclaimed memoir about his mother had been published two years ago, he got a telephone call from a woman who told him she was the Julia he had mentioned in his first chapter – his first girlfriend at 16, nearly 40 years ago. Could they meet, she asked? At first he wasn’t too sure whether they should meet for lunch or dinner. But dinner seemed better because he’d be able to have a drink. At their meeting, Julia told him that at 26 she had had an accident and couldn’t remember a thing of her life before then. How are poems made? Do they take long to gestate? He recalled how he wrote one of his famous poems, Seranade – a horse that threw his mother and injured her. After a book-signing evening in Lancashire with Seamus Heaney, he woke up the next morning and “perhaps out of admiration or competition” with the great Irish poet, he wrote the long poem in a matter of 10 minutes, hardly changing a word. It was all linked with memories of his mother and, as he said, it had been “cooking” a long time. The doors to poetry were opened to him, he said, at the age of 18 when his teacher introduced him to Sylvia Plath’s poem Mushrooms. “The teacher asked us what it meant,” he said. He thought for a few minutes and then experienced one of those life- shaking moments. “I suddenly realised it was about the Holocaust, or something similar,” he said. His love of poetry had begun. We were back to the meaning of words again, and what only poetry can achieve. They shoot innocent children, don’t they? WHAT’S Hollywood star Jane Fonda got to do with the Arab broadcaster Al Jazeera? She’s key to an ambitious wheeze to set up a rival news service, I’m told. Former United Nations big hitter Dennis Halliday, in London to address an anti-war conference, told me he’d been talking to a ­Middle East-based entrepreneur with plans to beam a hard-hitting news station right into America. Halliday, a leading figure in the anti-war movement since sensationally quitting the UN over Iraq, has been asked to pull strings. Over dinner at a Turkish restaurant he explained how he’s to use his contacts and legendary charm to get Ms ­Fonda to stroke the ego of her ex-husband, the CNN mogul Ted Turner, who it’s hoped will back the deal. America’s in desperate need of a wake-up call, opined Halliday. Often ­conservative, America’s become even more inward looking since the so-called War on Terror, taking its cue from Rupert Murdoch’s Fox News or, he confessed, like his own teenage daughter, from popular TV spoof news shows. Al Jazeera’s English ­version has flopped but the whacky idea is for a broadcaster that would highlight how America’s global ­policies impact on the domestic issues like jobs, housing, health and schools. Could it work? Fonda’s a liberal icon and Turner, busy running nature parks, enjoys playing the maverick. At the moment it’s just back-of-the-envelope and very hush-hush, admitted Halliday, but stranger things have happened. Halliday was Assistant Secretary General and the Humanitarian Co-ordinator in Iraq until he lifted the lid on the hundreds of ­thousands killed by sanctions in the 1990s before quitting amid a storm. He lives in Manhattan but London is home-from-home for the 67-year-old Irishman who cut his teeth as a protester in the anti-nuclear movement over here in the 1960s and 1970s. A high-level opponent of the war, he’s a thorn in side of the White House and Westminster – and his Manhattan ­neighbours, too, it seems. Since a series of television and radio interviews in which he condemned Israel’s policies he’s been shunned by his many Jewish neighbours.